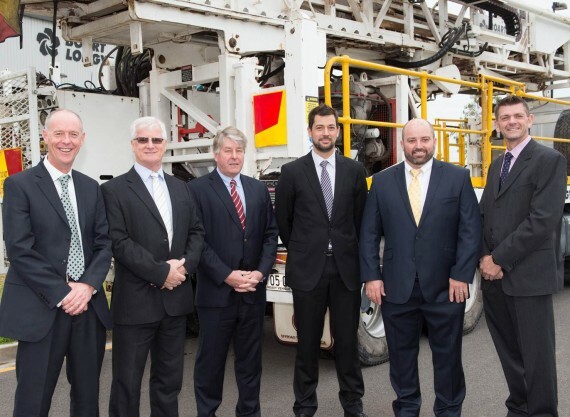 In a world-first collaboration of mineral explorers, drillers, government and research institutes, today the Deep Exploration Technologies Cooperative Research Centre (DET CRC), the Geological Survey of South Australia (GSSA, Department of State Development), mineral explorers Minotaur Exploration and Kingston Resources and drilling company Boart Longyear signed agreements to collaborate on a Mineral Systems Drilling Program (MSDP). The MSDP is aimed at both uncovering hidden mineral deposits in the highly prospective eastern Gawler Craton Olympic Copper-Gold Province (northern Eyre Peninsula), a district widely regarded as one of South Australia’s key emerging mineral provinces, and at developing the new technologies required for ongoing, cost-effective, successful mineral exploration beneath barren cover. Australia’s share of mineral exploration expenditure has halved from approximately one quarter to one eighth of the world’s total in the last 20 years. This decline has paralleled a decline in discovery of new major mineral deposits. Decreasing mineral exploration success and expenditure in Australia reflects the fact that relatively easy-to-find mineral deposits with a surface expression have largely been discovered. New mineral exploration provinces must be found hidden beneath barren cover rocks. New technologies are needed to search more efficiently and effectively. Steve Hill, Director of the Geological Survey of South Australia commented “We are putting all our chips on the table and working with industry to get the best possible return on our investment”. Tony Belperio, Executive Director Minotaur Exploration commented “We are pleased to collaborate in this delivery of cutting-edge science to our Gawler Ranges exploration program. Major advances in the productivity and success rate of mineral exploration will lead to widespread future benefits for communities”. The MSDP will trial several world-first technologies developed by DET CRC that aim to deliver real-time information and data analysis during a drilling program. These technologies will in turn enable and guide near real-time decision making. The Wireless Sub will monitor drilling parameters enabling them to be analysed at the drill site and remotely in order to optimise drilling performance and maximise productivity. The AutoSondeTM will provide geophysical wireline log-type data on the nature of the rocks intersected in drill holes without separate mobilization of a wireline logging crew or additional time requirements at the drill site. The AutoSondeTM is deployed into the hole by the driller and analyses the rocks intersected as the drill rods are pulled out of the hole. The Lab-at-Rig® will provide near real-time XRF geochemistry and XRD mineralogy on drill cuttings, allowing greater confidence in assessing the prospectivity of the drill core. All results will be able to be monitored remotely and permit ongoing analysis of the drilling program informing decisions such as whether to terminate or extend drill holes or whether to modify the location or trajectory of subsequent holes. The drilling program will be undertaken by Boart Longyear. As a DET CRC Participant, Boart Longyear are familiar with the new technologies being rolled out and are in an ideal position to both undertake the drilling work and facilitate the deployment of DET CRC’s new technologies. The agreements were executed on Thursday 25 June 2015 at the Boart Longyear Asia Pacific Headquarters in Adelaide, South Australia. Drilling is scheduled to commence in July 2015. The South Australian Government has backed the MSDP’s unique approach to exploration with an investment of $2 million from PACE Frontiers that has been leveraged into a $7 million program through partner contributions and in-kind support.